Today (3/12 here) is the day of silence in Bali, as the locals call it Nyepi. This is the day when everything is turned off and everyone stays at home for self reflection. No one is allowed outside, no planes, no cars, no activities, even the TV station is off. Fortunately the electricity (and most importantly for me, internet) is still on. 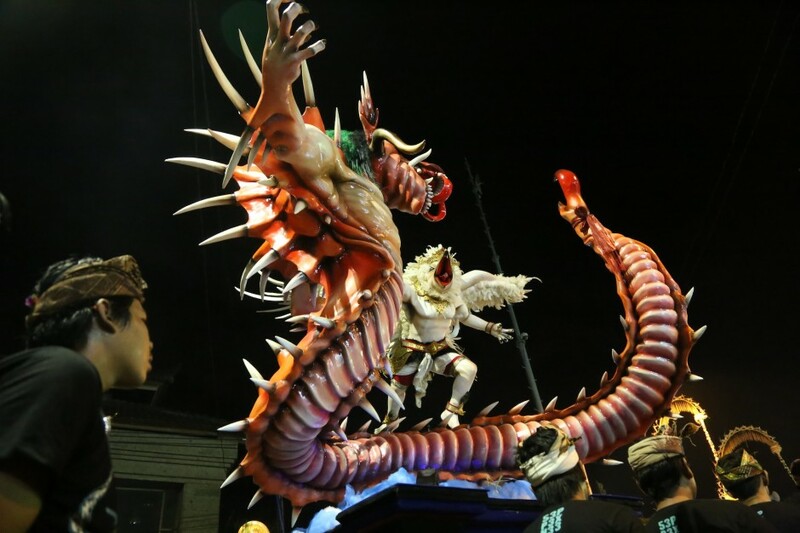 Another ritual as part of Nyepi that took place last night was the parade of Ogoh-ogoh. There were so many people out in the street, it was a struggle to move around. I’m surprised that we didn’t step (or get stepped) on more feet than we did. With the weather being hot and humid, watching Ogoh-ogoh was a truly like being in a sauna. But it was worth it because the statues were awesome and it was great to be part of this once a year tradition. So since we can’t really do anything outside of the hotel, the plan is to spend the day soaking in the pool, chilling in the pool, and some more soaking in the pool. We’re going to take advantage of this rest day after so much activities and little sleep since the start of the trip, and we will have full schedule starting tomorrow as well.